Roman Republic, C. Considius Nonianus (57 BC). 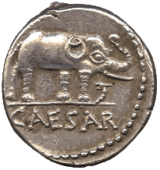 Silver Denarius mint of Rome. Obverse: Laureate bust of Venus facing right, [C • CONSIDI • NON]IANI behind. Reverse: ERVC, temple on the summit of a rocky mountain, surrounded by a wall with three towers. Good Very Fine. A well centred design on the reverse of this popular monumental Republican denarius.